Extra place race offers guide and how you can profit twice! What bookmakers have extra place offers? First of all what is an extra place race? A standard horse race is for 2, 3 or 4 places, the extra place is for 3rd, 4th or 5th place, sometimes more in large runner events like the Grand National or Cheltenham Gold Cup. As a matched bettor we can gain from these extra place races by placing an each way bet and hoping that our selection or selections can hit the extra place. Normally we would place a matched bet in order to gain a free bet, but with this strategy there are no free bets involved. If our horse finishes in 4th place in an extra place race we win twice, once with the bookmaker and also with the exchange. We would back the horse each way with the bookmaker and also place two exchange bets, one for the win and one for the place. I’ll explain in further detail about how to place these lay bets and what to look out for in this extra place race offers guide. Placing an each way bet is very straightforward with the bookmaker, you need to tick the “each way” box. Failure to place the bet each way can be a costly mistake if the horse loses or profitable if the horse wins. There are two types of odds that you will see with any horse race, 1/4 and 1/5. These 1/4 and 1/5 odds are what percentage of the place we would get paid, an example would be odds of 10.00, we would 2.5% in payout on the place for 1/4 odds or 2.00% with 1/5 odds. You will need to check how many places the bookmakers is offering, ie 4 or 5 places for the extra place and then check with the exchange, ie 3 or 4 to be placed. If you place a back bet for 3 places and then lay off for 3 places, there is nothing to be gained unless you are each way arbing. Once we have placed the each way bet with the bookmaker, we will need to lay off the bet with the betting exchange. The best way of calculating the lay bet is to use the Oddsmonkey extra place matcher and inputting the amount into the exchange. 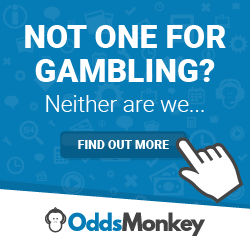 If you haven’t signed up to Oddsmonkey yet, then have a read of my Oddsmonkey review here. Most of the profit from matched betting comes from free bets and extracting the profit from the free bet. With extra place race offers, there are no free bets, if you hit the extra place, you will profit from winning your bookmaker bet and winning your exchange lay bets. Every day of the week there are extra place offers for horse racing, anything from 2 to 10 extra place races. The caveat is that the odds can be quite poor to match the bets up, you will have to be patient and wait for the exchange odds to drop. The great thing about extra places is the amount of profit you can make from, it’s literally up to you! An example would be £10 each way, total stake £20 on a horse with odds of 10.00, this would generate around £25 in profit. Now if you placed a bet of £50 each way, the profit would be around £125, but unless you arb both the win and the place, it would incur a higher qualifying loss if you don’t hit the extra place. An acceptable loss on £20 total stakes would £0 to £1. The odds of hitting the extra place depends on the size of the field, but as a general rule, I hit an extra place out of every 8 to 10 horses. You will need to keep the QL as low as possible and if the Oddsmonkey each way extra place matcher throws a good low QL match, then take it as you never know! When you hit the extra place, you will have winnings from the bookmaker for the place and you will have won both lay bets with the exchange, a double win. Even if you don’t hit the extra place, you can still gain from Best Odds Guaranteed if you win or hit the standard places. Major events like the Grand National or Epson Derby just about every bookmaker will have extra places on offer. Sometimes in large runner events there can be as many as 4 extra places on offer, SkyBet and William Hill often have more than 1 extra place on offer. These bookmakers usually have extra place race offers on everyday, Betfred, Boyle Sports, Coral, Ladbrokes, Paddy Power and SkyBet. If you are gubbed, then Boyle Sports will not offer you an extra place, very stingy I know! It maybe a good idea to use gubbed or stake restricted accounts to do extra place offers, but if the stakes are lower, then it will not attract much attention. I normally do 2 horses per race and will be best to place them at different bookmakers, if you can find very low QL, then do as many as you can, the more you have in a race, the increased chance of hitting the extra place. Extra place races are a fantastic way of increasing matched betting profits and they can used in conjunction with other offers for 1st or 2nd place. If you are gubbed or stake restricted and free bets are no longer offered, then these races can cover the loss. Placing each way bets can be stressful as you are placing 2 lay bets, but doing these racing can lead on to bad each way arbing for more profit. If you haven’t already signed up for Oddsmonkey, then the extra place matcher is worth while in itself. Thanks for posting the video, I’ve had trouble getting my ahead around extra places for a while but I feel much more confident about it now. What sort of QL would you typically be aiming for, say for a £10 EW bet? I normally do £10 e/w, so a total stake of £20 and aim for a QL of £0 to £1 per horse. Would you rexommend bet extra place on golf? Absolutely provided you got a low qualifying loss! The problem with extra places is that it is not guaranteed much like my 2 up offer! However if you can get your QL as low as possible, it will put you into a good position overall.